A bold medley of bright sweetness, and hints of tart citrus, a part of what we love about margaritas! beloved drink and the perfect cool treat for sunny days! Forget bottled mixes filled with artificial flavors, colors, and preservatives; Jet uses natural fruit juices (orange and lime), and real sugar for the easiest and most flavorful margarita around. The innovative cartons feature aseptic packaging that maintains the fresh fruit flavor; even without refrigeration, while sealed. 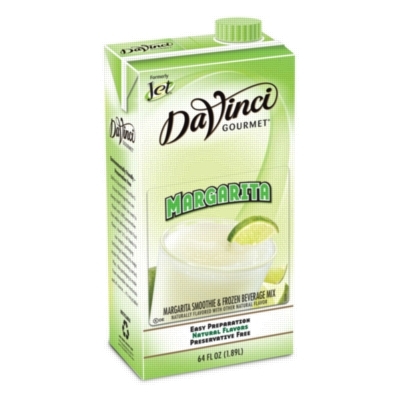 Designed for use in both cocktails and non-alcoholic drinks, and can easily be blended with other Jet fruit flavors for more flavor possibilities! Product is shelf stable until opening, refrigeration recommended once seal is broken. INGREDIENTS: Water, Sugar, Natural Flavor, Citric Acid, Orange Juice Concentrate, Sodium Citrate, Pectin, Lime Juice Concentrate, Guar Gum, Artificial Colors (Yellow 5, Blue 1).